This is what horror has become in 2018: a jump-scare fest where things like suspense and slowly-building dread have been pushed to the side. Darkness passes for atmosphere and intensity is bypassed because it's too strong for the all-important PG-13 rating. 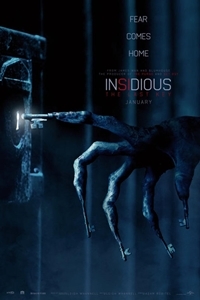 There's ample evidence that the producers (and writer/actor Leigh Whannell) are milking a familiar title for all it's worth - of the four Insidious films, only one has been any good and, although The Last Key may not be the worst of them, it's easily the most irrelevant and generic. The only story worth telling in the Insidious universe is the one James Wan brought to the screen in the 2010 original. The open-ended conclusion and box office success made a sequel inevitable and the result was a colossal disappointment. Stung by the backlash, Whannell decided that instead of moving forward with the third installment, he would delve into the past, bringing back his most popular character, the psychic Elise, played by Lin Shaye. For The Last Key, Whannell has elected to remain in the past, offering up a direct prequel to the first Insidious and once again focusing on Elise. Lazy writing abounds. To the extent that Whannell put effort and thought into crafting the first Insidious with meticulous world-building and satisfactory character development, he has been drifting since then. For The Last Key, he appears to have begun the creative process with a checklist of common horror clichés and made sure to check each one off the list as he incorporated it. This is a horror film for people too timid to appreciate real horror. It's a regurgitated product, familiar bits and pieces of teen-friendly "scary" stuff that mimics horror in disappointingly superficial ways. 2017's horror King, It, provides an effective counterpoint to The Last Key and proves that, when it comes to this genre, the R-rating is not a detriment. This movie spends an inordinate amount of time detailing Elise's abusive childhood (she's played as a girl by Ava Kolker and as a teenager by Hana Hayes). Her father (Josh Stewart) is a psychopathic lunatic while her mother (Tessa Ferrer) is kind-hearted and understanding. Supernatural things happen in the house and she runs away, eventually growing old to become the character who has provided the foundation for the Insidious franchise. When Elise receives a call from the current owner of her childhood demesne, she and her two mismatched cohorts, Tweedle-dee and Tweedle-Dum (actually Specs and Tucker, played by Whannell and Angus Sampson) head to the Haunted House to face off against its Weird Owner (Kirk Acevedo) and Resident Demon (who is named in the credits as - I'm not kidding about this - KeyFace). The movie is full of strange, inopportune, and largely unfunny jokes and successfully turns Elise's odd-but-likable sidekick duo into caricatures that are as creepy in their own way as the demons. At first, we're glad they're joining Elise on her road trip but when they start with inappropriate overtures toward her nieces, we start to wonder whether they should have been left behind. In the end, the movie feels more like an episode of Elise Rainier: Demon Hunter than a legitimate feature film and a showcase for its star. With Wan having left the franchise following the first sequel, Whannell took over the behind-the-scenes reins for Insidious 3. Here, he steps aside for Adam Robitel, who does an adequate job with the generic PG-13 tropes. He executes the jump-scares effectively, handles the "reveal" of the demon with enough panache to warrant mention, and does about the best anyone could probably do with such a limited and uninspired screenplay. I suspect the final product is more Whannell than Robitel but that's something we won't know until/unless he makes more movies (his filmography currently lists only one title, the 2014 indie horror The Taking of Deborah Logan). There's an audience out there for The Last Key. Although the series is in a slowly decaying orbit (with Insidious 3 having grossed considerably less than Insidious 2), production company Blumhouse knows how to make horror movies cheaply and turn a profit on even poorly-performing titles. The Insidious brand coupled with frequent shots of Shaye in the trailers virtually guarantees enough interest to move the film's ledger into the black. The production provides an early-year fix for PG-13 horror junkies but isn't sufficiently interesting, original, or scary to warrant attention from anyone outside that group. Insidious fans with low expectations will get what they want from this prequel and that's all the franchise needs to keep rolling.